anyone who’s ever co-habitated with a dog knows they love to snuggle, cuddle and lean… these oval beds with a continuous cushion all the way around the circumference enable all those activities. made in the u.s.a., the covers are sturdy, all-cotton 14 wale charcoal corduroy, zippered for easy removal of the inner poly cushion for washing. 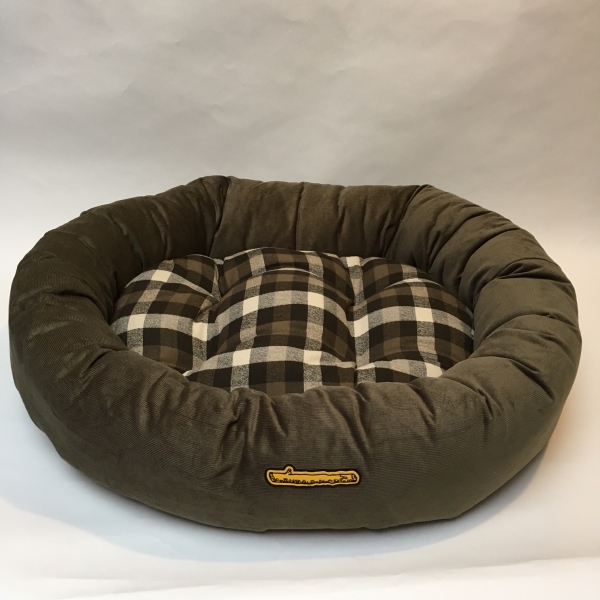 the checked red flannel center cushion flips to reveal the same corduroy as the bed, in case your pooch is not feeling the plaid on any given day. emblazoned with a felt stick on the front to ensure pride of ownership.